One of the things I love about the cooler weather is that you can dress in layers. This outfit is a good example of that. It started off with a pair of bootleg jeans and a plain v neck sweater… but that alone is just too boring. So, I added a layer. I added a purple tank under the sweater, and added a necklace on top. 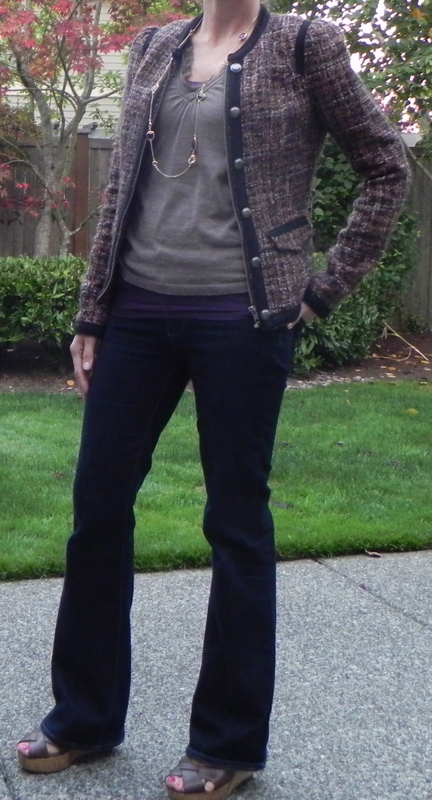 But that wasn’t enough so then I added this cool jacket over that- and voila- a layered and interesting outfit. I’ve had lots of readers ask me about bootleg jeans- so here they are! They honestly aren’t my favorite style- but for work they can be a nice substitute for trousers. Notice I wore them with a heel, which is a must with bootleg! Very cute outfit and I love the layers idea. Thanks so much for the boot cut. I think you look great! I Love your tweed jacket:) And the boot cut is great! Thanks! I bought this 2 years ago- and wasn’t sure about it (the sales gal convinced me I needed it). It was pricey (to my modest budget)- but now looking back, was a great piece to add to my wardrobe! Your comment made my day!!! So, thank you for your kindness! I absolutely love that tweed jacket. If you live in Utah, maybe I could borrow it?! haha! Sorry, I am in the Seattle area! Darn- sharing clothes would be fun! Love the jacket! Wish it was cool enough in LA to layer! Thanks! I do love the fall season- I can’t imagine living in a place where it’s summer all year- although talk to me in Jan and I’ll be envious of your sunshine!